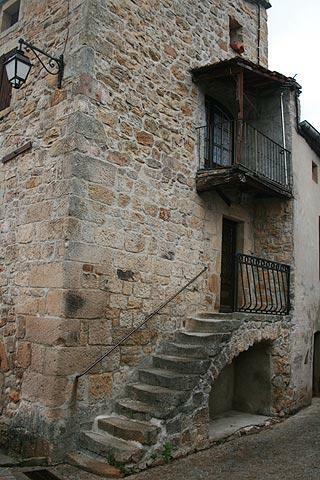 Ailhon is found a few kilometres to the south-west of Aubenas in Ardeche. Listed as one of just 17 Ardeche 'villages of character', the village is very small and set in rolling hills covered with pine forests, in a position occupied since prehistoric times - as revealed by the prehistoric monuments at Daus. In the centre of the village itself, there is little more than an open square and a single street running off it lined with attractive medieval houses. One of the houses (Maison Chabert) includes a tower that was once part of an active castle that stood here during the Wars of Religion. The roman style Church of Saint-Andre on the square dates in part from the 12th century, with later modifications made until the 16th century, and has an arched stone entrance. Inside the church there are several notable sculptures and an old stone baptismal font. Also in Ailhon there is an area of terracing, a traditional farming technique in the region, called the 'faysses', with a path that leads through the terraced areas and down to the stream at the bottom. There is a small cafe in the village for when you have finished exploring. Ailhon is best thought of as a very extended village - it has several even smaller hamlets associated with it nearby (including Chaunes, Védignac, Le Meygris, Daüs, Le Plot, La Lieure and La Chaberterie) each with their own characteristics and features and each forming part of the whole. These hamlets are all interlinked with narrow country roads and footpaths providing a very enjoyable way to explore the countryside. See the map in front of the church for details. 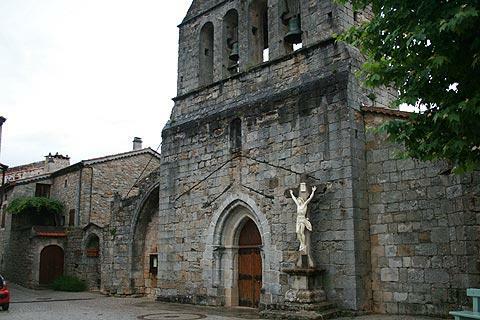 Several other of the Ardeche villages of character are also close to Ailhon and worth exploring - see Ardeche villages for details and a map.